The Giving Garden is a ministry that the Church On Northland began in the summer of 2013. We planted flowers, fruits, and vegetables to benefit Mission Of Hope and help aid those in the community who may not have access to fresh produce. The Giving Garden was such a success that it is now an annual ministry. 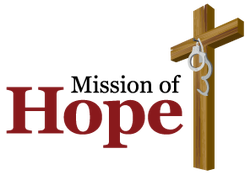 Mission of Hope’s vision is to provide a 24/7 Christ-centered ministry offering physical, emotional, and spiritual help to former offenders and others in need. Just as their Shelter is open 24/7, they desire that the Mission be also – providing Bible studies, worship services, and prayer around the clock, day and night. Visit Mission Of Hope's website to learn more about the ministry and the services they offer. Bridgehaven has been serving the greater Cedar Rapids area for over 30 years. Their services are at no cost, so there is no need for clients to worry about billing or the hassle of insurance paperwork. All services are private and confidential. Bridgehaven does not offer abortion services or abortion referrals. However, it is a safe place to discuss this option being offered to women so they understand the procedures and possible physical and mental health risks to consider. Many women appreciate the pleasant, non- judgmental environment at Bridgehaven.